It’s easy to determine the year (and even month) of origin for promo posters & displays tied to a specific record. 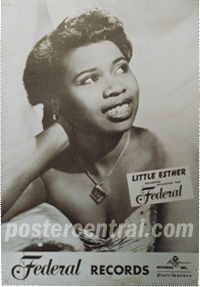 But there are also “generic” promo pieces that simply promoted the artist and their record label, such as “Little Esther on Federal Records.” These could obviously have a longer shelf life, sometimes years. If an old promo piece was displayed for years it’s often faded from the cruel sun or record-store lights. Promo posters were usually made of paper, and displays always made of cardboard. Other than that, they ranged from tiny to huge, from B&W to wildly colorful, from simple to highly imaginative. Check out a few of these exciting promo posters and displays shown here, and feel free to submit your own images (from the 1960s or older) for evaluation, discussion and possible inclusion here. And remember, I pay top dollar for vintage record-company promo posters and displays of this nature. 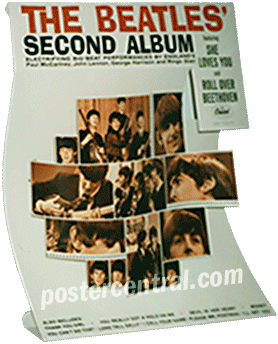 Details on the promo posters & displays found here: The Beatles’ Second Album (large 1964 cardboard display by Capitol Records); They’re Great! They’re Outrageous! They’re Rebels! They’re England’s Hottest… But Hottest… Group! Watch Out USA… Here They Are! 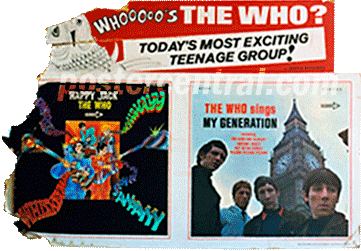 The Rolling Stones – New LP On Sale Here (1964 paper banner by London Records); Whooooo’s The Who? Today’s Most Exciting Teenage Group! 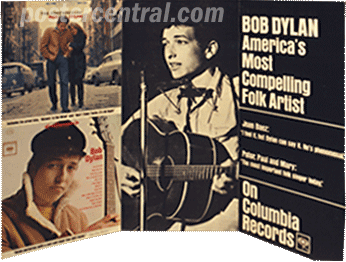 (large 1967 cardboard easel-back display by Decca Records, picturing Happy Jack and The Who Sings My Generation); Bob Dylan: America’s Most Compelling Folk Artist. Joan Baez: “I feel it, but Dylan can say it. 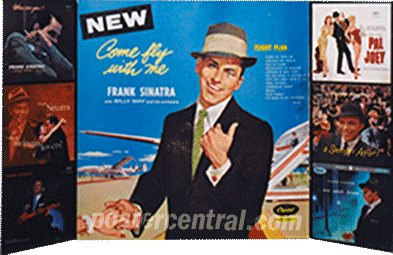 He’s phenomenal.” Peter, Paul and Mary: “The most important folk singer today.” On Columbia Records (large 1963 cardboard display); New: Come Fly with Me album by Frank Sinatra with Billy May and his orchestra. Also plugs the following six Capitol LPs: Where Are You?, Songs For Swingin’ Lovers!, Close To You, Pal Joey, A Swingin’ Affair! 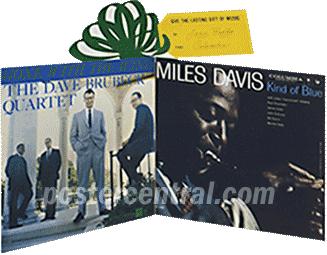 and In The Wee Small Hours (large 1958 cardboard display by Capitol Records); Miles Davis: Kind of Blue and The Dave Brubeck Quartet: Gone With The Wind. To Jazz Buffs from Columbia Records… Give the Lasting Gift of Music (1959 cardboard display); and Little Esther Recording Exclusively for Federal Records (King Records Inc., Distributors) (early 1950s easel-back cardboard display).